2 Day Scenario Game - "BEEP! BEEP! 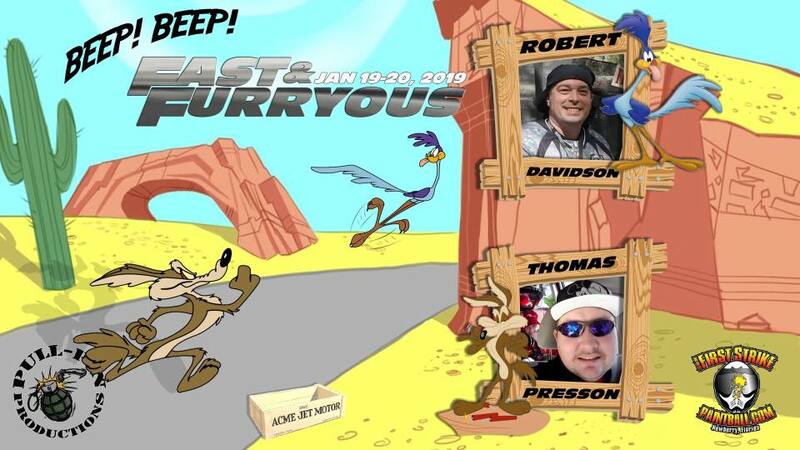 Fast and Furryous" SCENARIO GAME at First Strike Paintball - January 19-20th, 2019 (Register Now !!!!!). This will be a Field paint only event (Graffiti $50 Case-PreOrder, *After 1/5/2019, $60, First Strike Rounds $85, Pre-Order Only). Entry Fee/Air will be $60.00 until January 5th, 2019, after this date Entry Fee/Air will be $70.00. Game Day Paint Prices: Graffiti $60. FOR MORE INFO CHECK OUR FACEBOOK EVENT PAGE. ***Tank Friendly Field must show proof of Insurance. Tank driver and walker will be comp'ed into the game as well as both Commanders and XOs. ***RV Camping at Canterbury Showplace RV Park 352-472-6758 $28.00 per night. 1 Day Game - "King of the Hill" BIG GAME at First Strike Paintball - May 26th, 2018. This will be a Field or BYOP paint only event ($35 Case). Three Teams, one winner, who will be the King. It's that time of the year again, it's HOT, so lets play in the shade. Going to switch things up a little this year, there will be three Captains, the teams will be drawn randomly from the players attending. $45 gets you entry/air and a case of paint, additonal paint $35.00 per case. $30.00 gets you entry/air and you can BYOP! 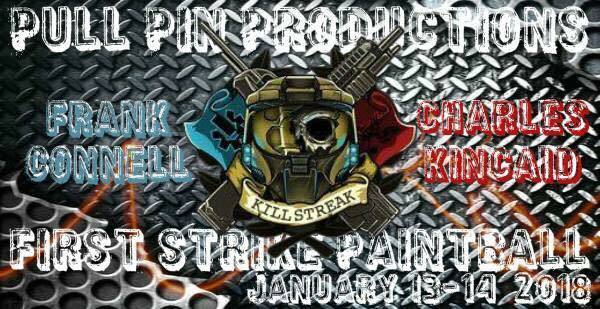 2 Day Scenario Game - "Red vs Blue Kill Streak" SCENARIO GAME at First Strike Paintball - January 13-14th, 2018 (Register Now !!!!!). This will be a Field paint only event ($50 Case-PreOrder). The Leader for the Blue Team will be Frank Connell. The Leader for the Red Team will be Charles Kincaid. Entry Fee/Air will be $60.00 until January 10th, 2018, after this date Entry Fee/Air will be $70.00. 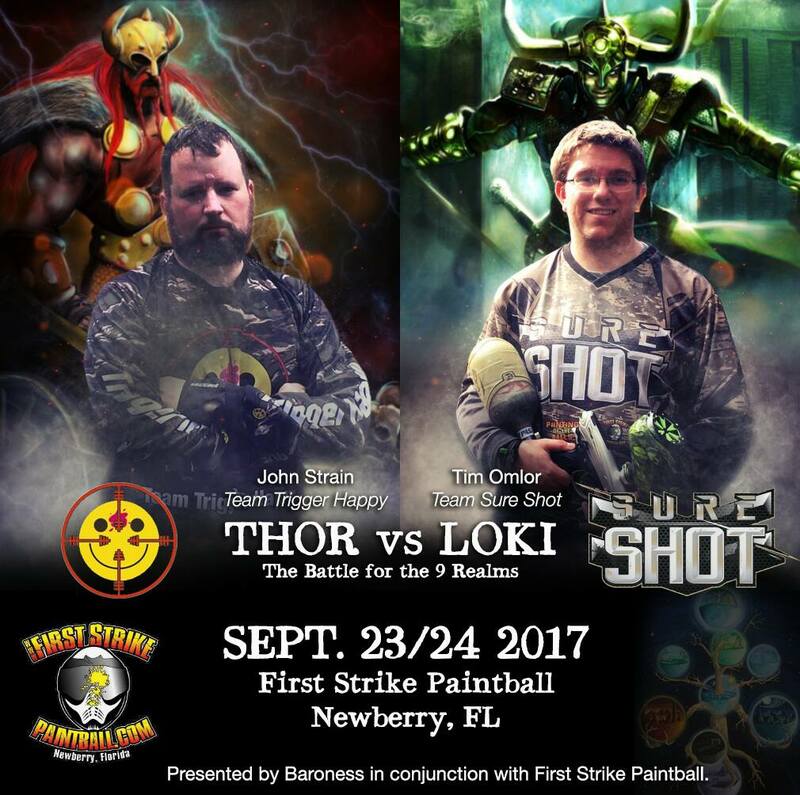 4 Day Hunt - "Halloween Activity" at First Strike Paintball - Oct. 27-30th, 2017.This will be a Field paint only event. This is a Safari Train Ride to shoot real zombies, "you get to shoot but you don't get shot." If the train breaks down you have to escape the zombie infested woods on foot. Trained guards will guide you through the woods. Those who cannot transverse the woods can stay on the train to return to the entrance. All Proceeds benefit Charity Nerds. 2 Day Scenario Game - "Halo - Red vs Blue" SCENARIO GAME at First Strike Paintball - January 14-15th, 2017 (Register Now !!!!!). This will be a Field paint only event ($45 Case-PreOrder). 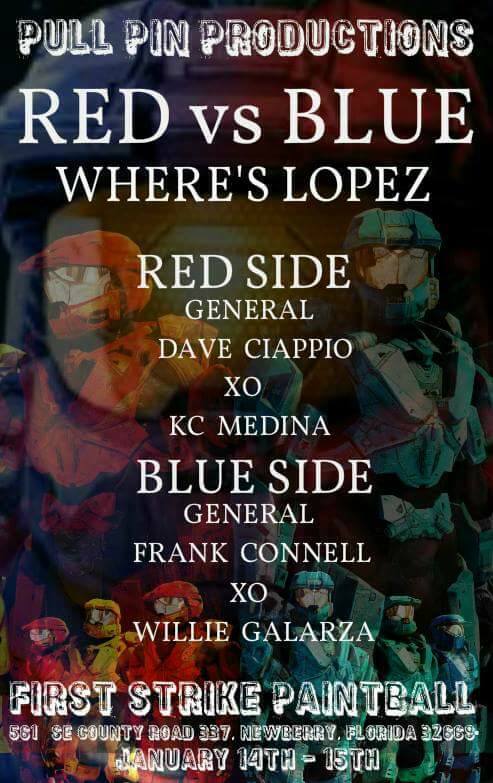 The General for Team Red will be Dave Ciappio. The General for Team Blue will be Frank Connell. PreReg - Entry Fee plus Air will be $60.00 until Jan. 1st, 2017, after this date the Entry Fee plus Air will be $70.00. 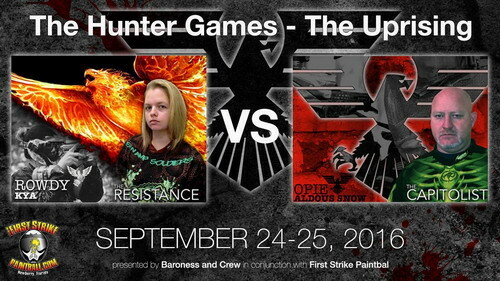 2 Day Scenario Game - "The Hunter Games - Uprising" SCENARIO GAME at First Strike Paintball - September 24-25th, 2016 (Register Now !!!!!). This will be a Field paint only event ($50 Case-PreOrder, Game Day = $60/cs). The Leader for the Resistance Team will be Rowdy Kyal. The Leader for the Capitolist Team will be Opie Aldous Snow. Entry/Air Fee will be $50.00 until August 23rd, 2016, after this date Entry/Air Fee will be $60.00. High Pressure Air/CO2 for the event will be $15.00. 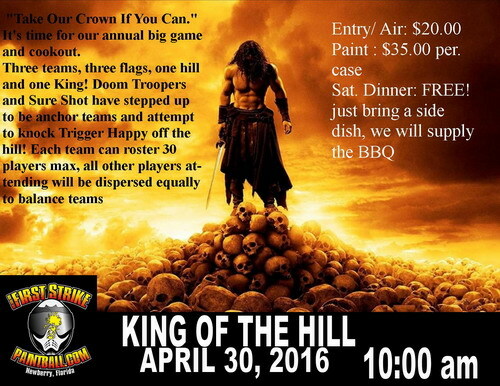 1 Day Big Game - "King of the Hill" Big GAME at First Strike Paintball - April 30th, 2015 (Register Now !!!!!). This will be a Field paint only event ($35 Case), Entry & Air $20.00. There will be three anchor teams, Trigger Happy, Doom Troopers, and Sure Shot. 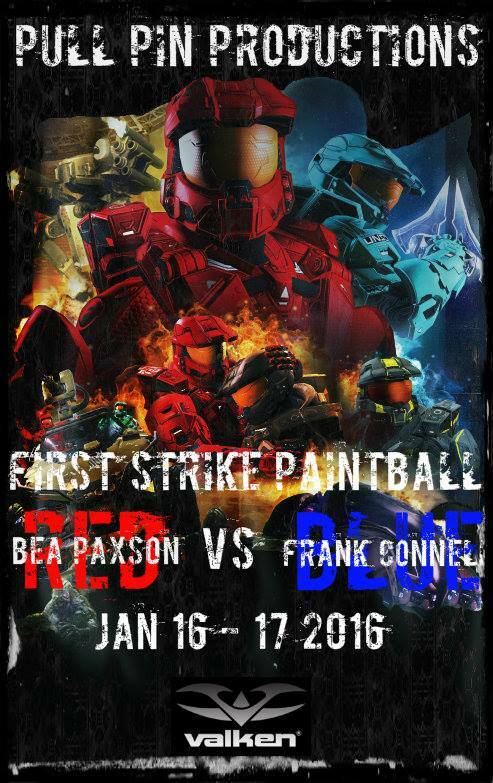 2 Day Scenario Game - "Halo - Red vs Blue" SCENARIO GAME at First Strike Paintball - January 16-17th, 2016 (Register Now !!!!!). This will be a Field paint only event ($45 Case-PreOrder). The General for Team Red will be Bea Young. The General for Team Blue will be Frand Connell. PreReg - Entry Fee plus Air will be $60.00 until Jan. 10th, 2016, after this date the Entry Fee plus Air will be $70.00. 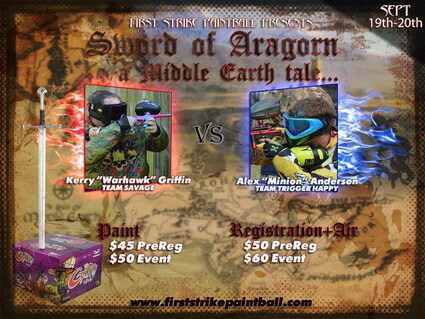 2 Day Scenario Game - "Sword of Aragorn" SCENARIO GAME at First Strike Paintball - September 19-20th, 2015 (Register Now !!!!!). This will be a Field paint only event ($45 Case-PreOrder). The General for Team Savage will be Kerry "Warhawk" Griffin. The General for Team Trigger Happy will be Alex "Minion" Anderson. Entry Fee plus Air will be $50.00 until Sept. 18th, 2015, after this date the Entry Fee plus Air will be $60.00. 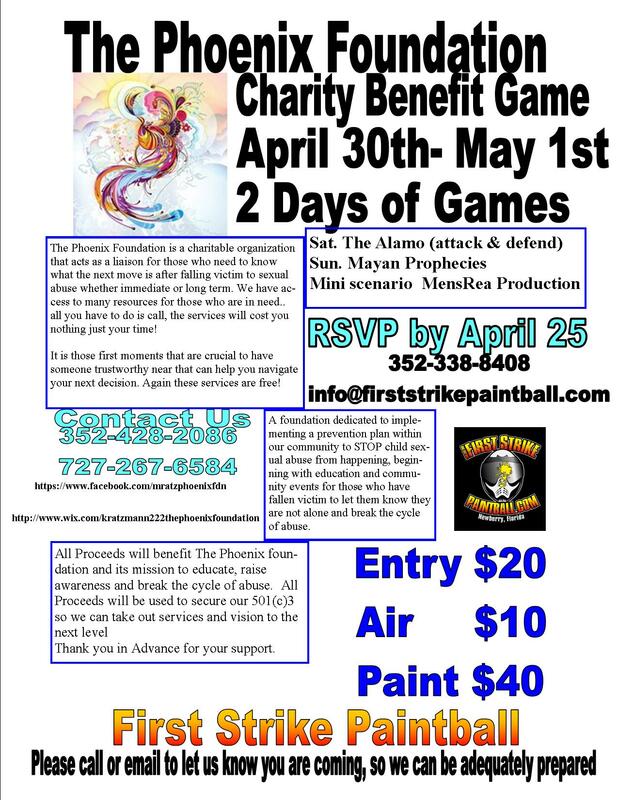 2 Day Big Game - "King of the Hill" Big GAME at First Strike Paintball - March 28-29th, 2015 (Register Now !!!!!). This will be a Field paint only event ($45 Case), Entry & Air $25.00. There will be three anchor teams, Trigger Happy, Bad Monkeys, and Sure Shot. Now this is how it works, the three anchor teams, Trigger Happy, Bad Monkeys and Sure Shot, provide com-mand for their teams. We take the other players attending and place them on teams to achieve (as best we can) three equal teams. Then each team will take a turn defending the hill against the other two teams combined, this creates a two to one advantage for the attacking team. The winner is determined by who holds the hill the longest. Camping will be available for anyone wishing to come early or stay over, although the game is played on Sat. all players are welcome to stay over to play on Sun. or just hang out and relax. The cost covers both days of play. We will be doing a cookout on Sat. night for all those attending. 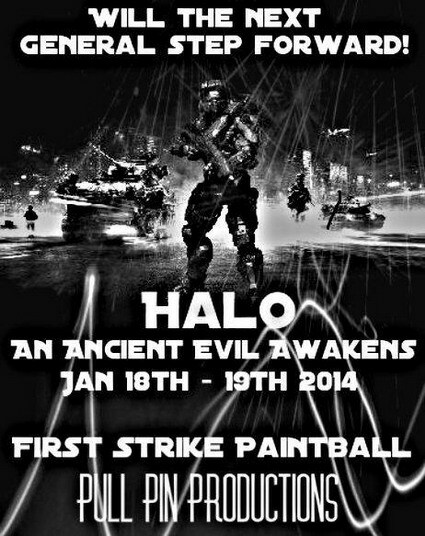 Day Scenario Game - "Halo - Spartan Assault Redux" SCENARIO GAME at First Strike Paintball - January 17-18th, 2015 (Register Now !!!!!). This will be a Field paint only event ($50 Case-PreOrder, Game Day = $60/cs). The Leader for the Blue Team will be Frank Connell. The Leader for the Red Team will be Rocky Cagnoni. Entry Fee will be $45.00 until January 10th, 2015, after this date Entry Fee will be $55.00. High Pressure Air/CO2 for the event will be $15.00 per person. 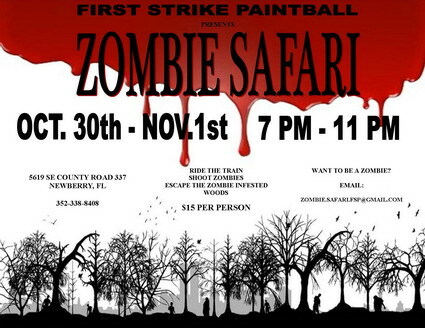 3 Day ZomeGame - "Halloween Activity" at First Strike Paintball - Oct. 30th to Nov. 1st, 2014.This will be a Field paint only event. This is a Safari Train Ride to shoot real zombies, "you get to shoot but you don't get shot." If the train breaks down you have to escape the zombie infested woods on foot. Trained guards will guide you through the woods. Those who cannot transverse the woods can stay on the train to return to the entrance. 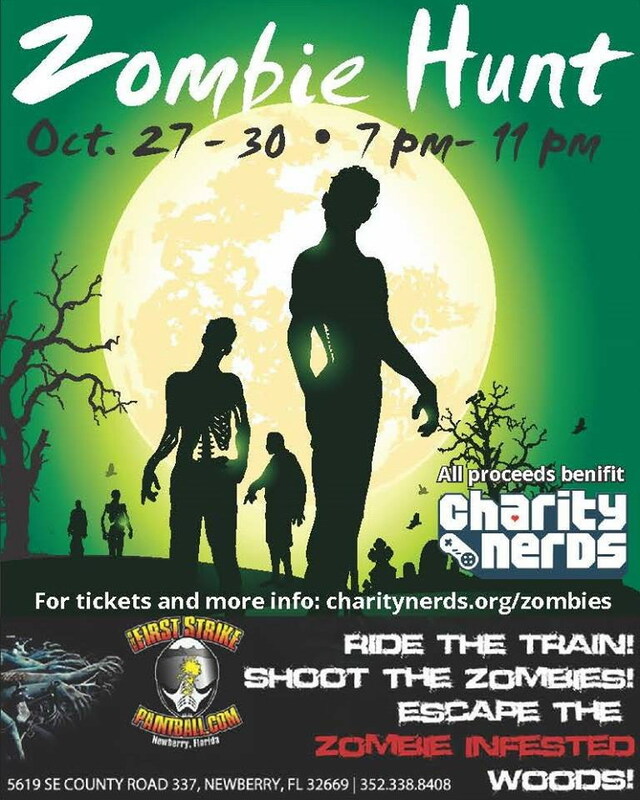 If you are interested in volunteering to be a zomie, contact us @ zombie.safari.fsp@gmail.com. Event fee is $15.00 per person. 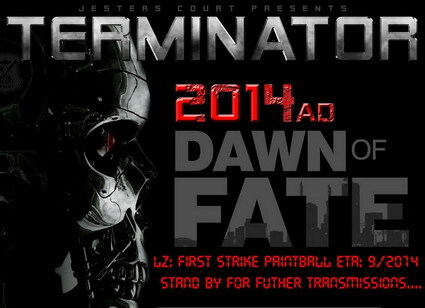 3 Day Scenario Game - "Terminator - Dawn of Fate" SCENARIO GAME at First Strike Paintball - September 26-28th, 2014 (Register Now !!!!!). This will be a Field paint only event ($50 Case-PreOrder). The General for the Cyberdyne will be Demian Ingerman. The General for the Resistance Team will be Chris BrodskySr. Entry Fee will be $45.00 until Sept. 17th, 2014, after this date the Entry Fee will be $55.00. High Pressure Air/CO2 for the event will be $15.00. Do you and your team have what it takes to be crowned "King"? Looking for three teams to anchor this event; Teams must have at least 10 players. All other players will be placed on one of the three anchor teams in order to create three equal sides. We will then play a series of attack and defend flag games with a two to one ratio ( two attackers per one defender) the team with the best combined time will be crowned King! 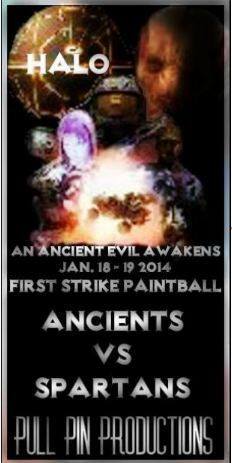 2 Day Scenario Game - "Halo - An Ancient Evil Awakens" SCENARIO GAME at First Strike Paintball - January 18-19th, 2014 (Register Now !!!!!). This will be a Field paint only event ($50 Case). No Need to preorder. The General for the Spartans will be TBA. The General for the Ancients Team will be TBA. Entry Fee will be $45.00 until January 6th, 2014, after this date the Entry Fee will be $55.00. High Pressure Air/CO2 for the event will be $15.00. 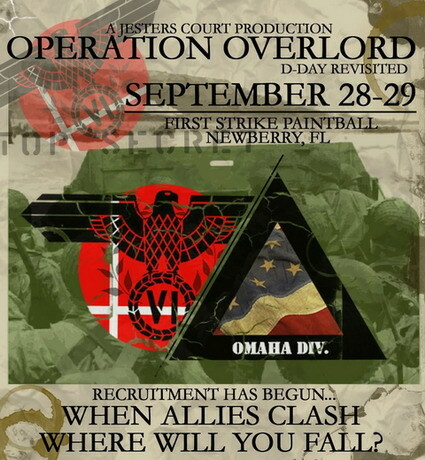 2 Day Scenario Game - "Operation Overlord" SCENARIO GAME at First Strike Paintball - September 28-29th, 2013 (Register Now !!!!!). This will be a Field paint only event ($50 Case). No Need to preorder. The General for the Allies will be Rocky Cagnoni. The General for the Axis Team will be Kerry Warhawk Griffin. Entry Fee will be $45.00 until Sept 15th, 2013, after this date the Entry Fee will be $55.00. High Pressure Air/CO2 for the event will be $15.00. 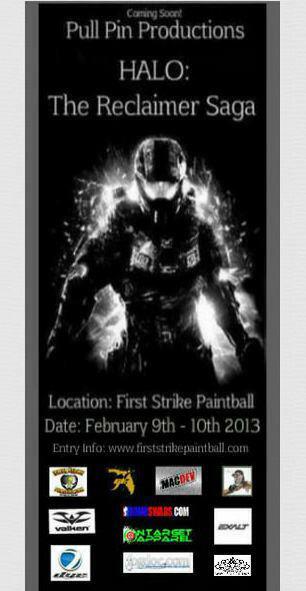 2 Day Scenario Game - "Halo - The Reclaimer Saga" SCENARIO GAME at First Strike Paintball - February 9-10, 2013 (Register Now !!!!!). This will be a Field paint only event ($50 Case). No Need to preorder. The General for the Covenant Team will be David "NinjaDave" Cloyd of Team Trigger Happy. The General for the SpartanTeam will be Mike "Tech PB" Philips of Team Citrus Connection. Entry Fee will be $45.00 until January 26th, 2013, after this date the Entry Fee will be $55.00. High Pressure Air/CO2 for the event will be $15.00. 2 Day Scenario Game - "The Battle for 1313 Mocking Bird Lane " SCENARIO GAME at First Strike Paintball - September 29 & 30, 2012 (Register Now !!!!!). This will be a Field paint only event ($45 Case). No Need to preorder. 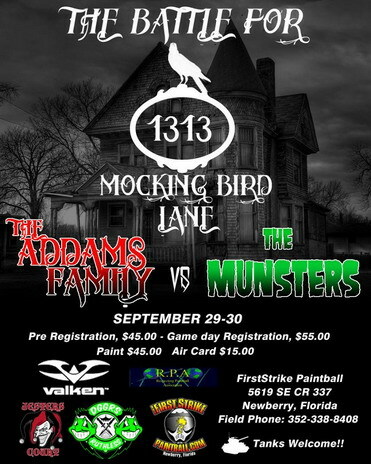 The Commander for the Munsters Team will be "Blake French" of Team Misfits. The Commander for the Addams FamilyTeam will be "Joseph Brown" of Team Hog Wild. Entry Fee will be $45.00 until September 19th, 2012, after this date the Entry Fee will be $55.00. High Pressure Air/CO2 for the event will be $15.00. 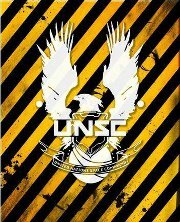 2 Day Scenario Game - "HALO - Retun of the Master Chief " SCENARIO GAME at First Strike Paintball - February 25 & 26, 2012 (Register Now !!!!!). This will be a Field paint only event ($50 Case). No Need to preorder. 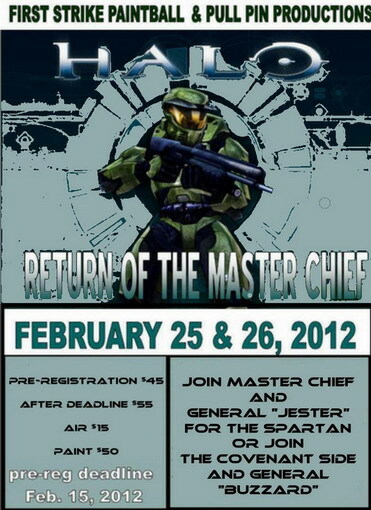 The General for the Spartan Team will be "Jester" of Jesters Court. 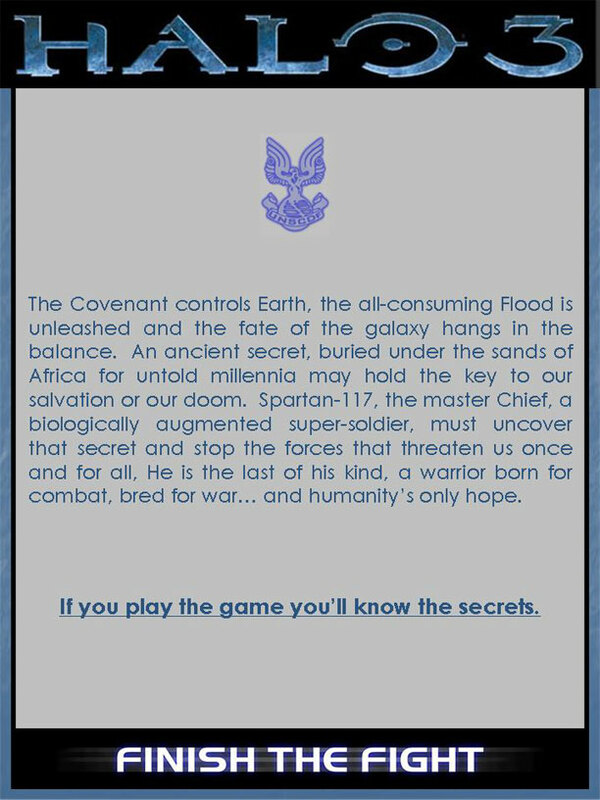 The General for the Covenant Team will be "Buzzard" of TOT. Entry Fee will be $45.00 until Febuary 15 th, 2012, after this date the Entry Fee will be $55.00. High Pressure Air/CO2 for the event will be $15.00. 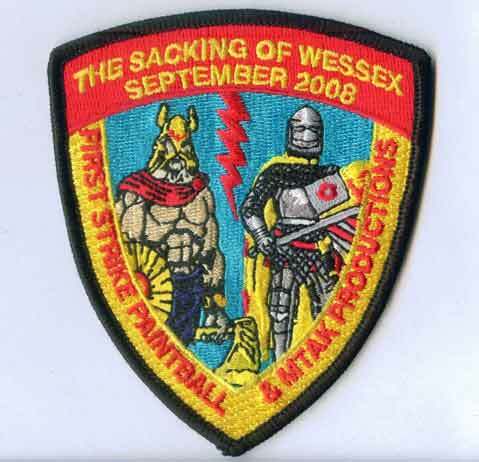 Pre-Reg now and receive this patch to attach to your outfit. 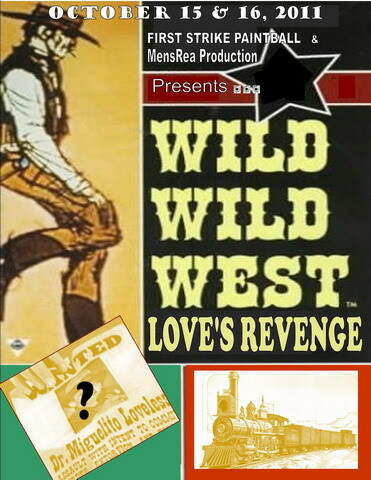 2 Day Scenario Game - "Wild Wild West - Love's Revenge" SCENARIO GAME at First Strike Paintball - October 15 & 16, 2011 (Register Now !!!!!). This will be a Field paint only event ($50 Case). No Need to preorder. The General for the President Grand Team will be TBA . The General for the Dr. Loveless Team will be TBA. Entry Fee will be $45.00 until October 10th, 2011, after this date the Entry Fee will be $55.00. High Pressure Air/CO2 for the event will be $15.00. It has been two years since the Civil War ended. The states are still struggling to rebuild after the war. The U.S. government worst fears of another state succeeding are in the news. The great state of California who has just elected a new governor a Dr. Miguelito Quixote Loveless, who favorers a return of being ruled by Spain. What is not known is the new governor family once own most of Southern California by a large land grant given by the Viceroy of Mexico under Spain. 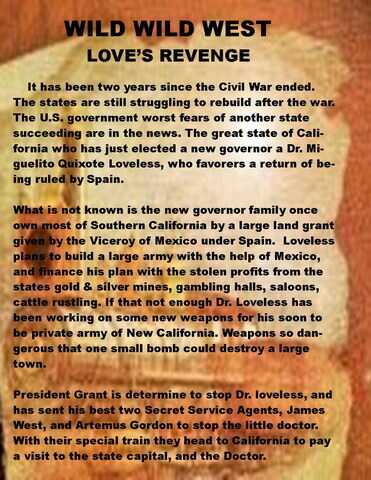 Loveless plans to build a large army with the help of Mexico, and finance his plan with the stolen profits from the states gold & silver mines, gambling halls, saloons, cattle rustling. If that not enough Dr. Loveless has been working on some new weapons for his soon to be private army of New California. Weapons so dangerous that one small bomb could destroy a large town. President Grant is determine to stop Dr. loveless, and has sent his best two Secret Service Agents, James West, and Artemus Gordon to stop the little doctor. With their special train they head to California to pay a visit to the state capital, and the Doctor. 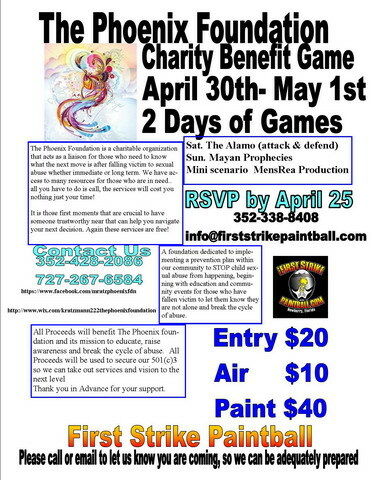 2 Day Charity Benefit Game - "The Alamo & Mayan Prophecies " Mini Scenarios at First Strike Paintball - April 30th & May 1st, 2011 (Register Now !!!!!). This will be a Field paint only event ($40 Case). No Need to preorder. Entry Fee will be $20.00. High Pressure Air/CO2 for the event will be $10.00. The Phoenix Foundation is a charitable organization that acts as a liaison for those who need to know what the next move is after falling victim to sexual abuse whether immediate or long term. We have access to many resources for those who are in need.. all you have to do is call, the services will cost you nothing just your time! It is those first moments that are crucial to have someone trustworthy near that can help you navigate your next decision. Again these services are free! 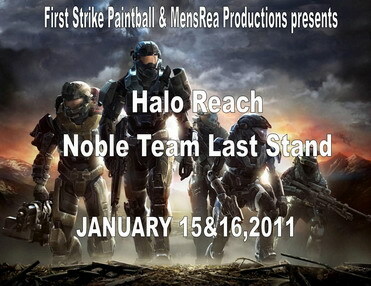 2 Day Scenario Game - "Halo Reach" SCENARIO GAME at First Strike Paintball - January 15 & 16, 2011 (Register Now !!!!!). This will be a Field paint only event ($45 Case). No Need to preorder. The General for the Noble Team will be TBA . The General for the Covenant will be TBA. 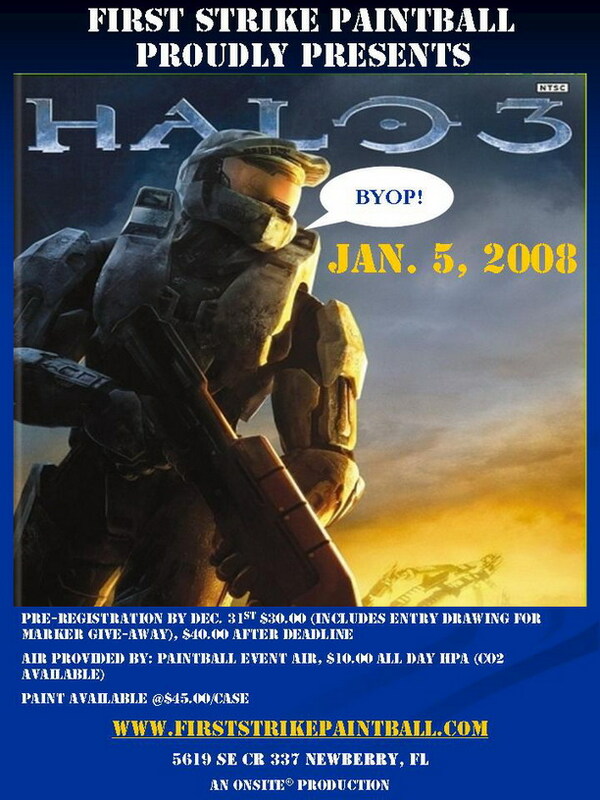 Entry Fee will be $45.00 until January 10th, 2011, after this date the Entry Fee will be $55.00. High Pressure Air/CO2 for the event will be $17.00. Man has looked out into deep space, and dreams of great wonders, and wealth on distant planets. But what he has mostly found is deep cold space. Where no one will hear you scream and death is found in dark places. The year is 2552; the UNSC has received word that a great fleet of Covenant troop landing ships is headed to the colony world of Reach. The few Spartan units have been placed on alert. The Spartans are greatly out numbered, but they know if they don't hold out until reinforcements show up, the colony of Reach will be wiped out by alien invaders. Come join Lieutenant S-312, Noble6, and the other members of Noble company as they fight the many campaigns, and firefights of Reach. 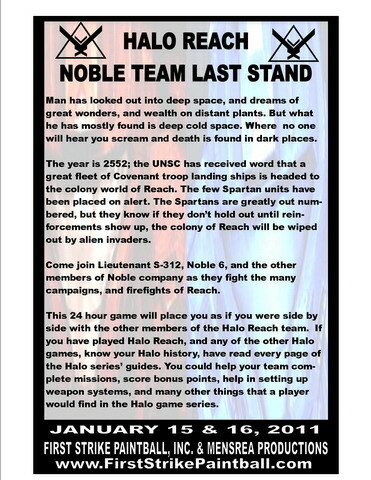 This 24 hour game will place you as if you were side by side with the other members of the Halo Reach team. If you have played Halo Reach, and any of the other Halo games, know your Halo history, have read every page of the Halo series' guides. You could help your team complete missions, score bonus points, help in settuip up weapon systems, and many other things that a player would find in the Halo game series. 2 Day Scenario Game - "Yamashjta Gold s " SCENARIO GAME at First Strike Paintball - October 2nd & 3rd, 2010 (Register Now !!!!!). This will be a Field paint only event ($45 Case). No Need to preorder. The General for the Japanese will be TBA . The General for the Americans will be TBAl. Entry Fee will be $45.00 until Sept. 28th, 2010, after this date the Entry Fee will be $55.00. High Pressure Air/CO2 for the event will be $17.00. From 1942 to 1945 during world war II the wealth of 12 Asian countries, accumulated over thousands of years was systematically plundered by the invading army of Japan. Expert teams accompanying Japan’s armed forces emptied treasuries, banks, factories, private homes, pawn shops, art galleries, confiscated temple treasures and stripped ordinary people, while Japan’s top gangsters looted Asia’s underworld and its black economy. All this treasure was shipped to the Philippines for transshipment to Japan. Growing Allied control of shipping routes made it increasingly difficult for the Japanese to transport such a cargo safely, and much of it was concealed in the Philippines. The person responsible of this task was General Yamashita. Much of this treasure was assembled and buried before his arrival in the Philippines. Some of the treasure is alleged to have been buried by prisoners of war that were then entombed with the riches in booby-trapped locations. There were 175 Imperial treasure sites hidden throughout the Philippines. When the American forces were close, the chief engineers of the vaults were given a fare well party 67 meters underground in Tunnel 8 in the mountains of Luzon, stacked with rows after rows of gold bars. As the evening progressed, they drank great quantities of wine, sang patriotic songs and shouted Banzai (long life). At midnight, General Yamashita and his body guards slipped out, and dynamite charges were set off in the access tunnels, entombing the engineers. Their vaults and the exact location would remain secret. 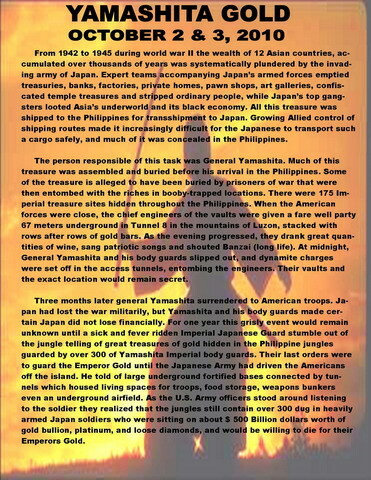 Three months later general Yamashita surrendered to American troops. Japan had lost the war militarily, but Yamashita and his body guards made certain Japan did not lose financially. For one year this grisly event would remain unknown until a sick and fever ridden Imperial Japanese Guard stumble out of the jungle telling of great treasures of gold hidden in the Philippine jungles guarded by over 300 of Yamashita Imperial body guards. Their last orders were to guard the Emperor Gold until the Japanese Army had driven the Americans off the island. He told of large underground fortified bases connected by tunnels which housed living spaces for troops, food storage, weapons bunkers even an underground airfield. As the U.S. Army officers stood around listening to the soldier they realized that the jungles still contain over 300 dug in heavily armed Japan soldiers who were sitting on about $ 500 Billion dollars worth of gold bullion, platinum, and loose diamonds, and would be willing to die for their Emperors Gold. 2 Day Scenario Game - "Attack of the NecroMongers " SCENARIO GAME at First Strike Paintball - May 1 & 2, 2010 (Register Now !!!!!). This will be a Field paint only event ($45 Case). No Need to preorder. The General for the NecroMongers will be Lord Marshall "Andy Potter" Procaps paint rep . The General for the Furyans will be William "Joe Moffo" Southern Extreme Paintball. Entry Fee will be $45.00 until April 27th, 2010, after this date the Entry Fee will be $55.00. High Pressure Air/CO2 for the event will be $17.00. In the year 3099, man has crossed far out into space, finding new worlds, and new enemies. One of these new enemies was a dark evil race called the Necromongers, an iron army crusading across the universe draining planets of their resources, converting inhabits to their side killing all who refused, and when they had taken all they wanted. They would trigger the conquest icon setting off the final Ascension Protocol destroying the planet and moving on. The Necromongers were led by one called lord Marshal, who has made a pilgrimage to the gate of the Under Verse and return a different being, stronger, stranger, Half-alive and holly half dead some thing else. However, even this great evil has a fear. 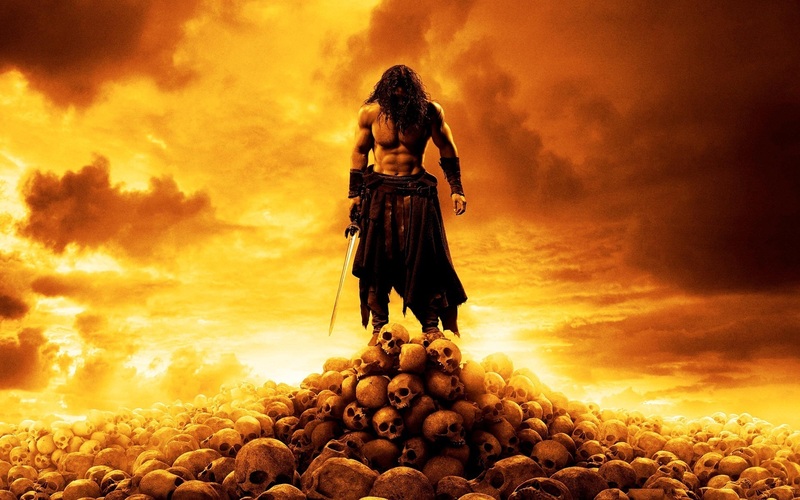 A fear which was told to him by a Elemental in a prophecy who told of a race of great warriors called Furyans who one day could defeat the Necromongers ending their wrath of evil. If the Necromonger belief that human life in this universe is a mistake which must be corrected, and the idea of the Under verse is both the after life of the Necromancers and the ultimate destination of their interstellar journey, which is described as another universe in which life is cherished and even the dead are brought back to life. They must first rid them self of the Furyan prophecy if they are to stand before the gates of the Under verse. The Furyan planet has been located, the Necromonger armada has started its attack decent. The Furyan air defenses are ready to engage the first wave of the Necromonger fighter ships. 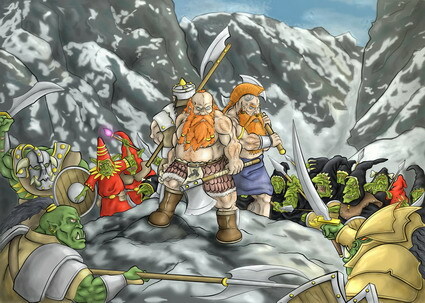 William the leader of the Furyan warriors has his forces ready to defend the Furyan home world. If our universe is to survive, this dark evil must be stop here today. In normal times, evil would be fought by good, but in times like these. It may need to be fought by some thing else, another kind of evil. Which side of evil will you be on? 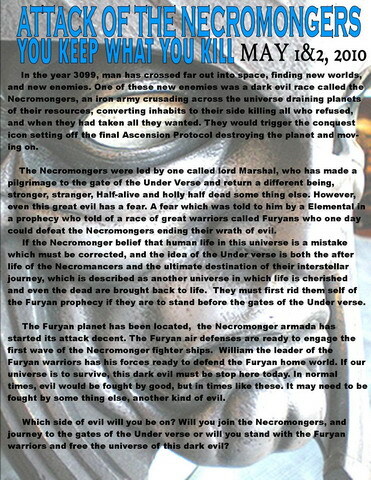 Will you join the Necromongers, and journey to the gates of the Under verse or will you stand with the Furyan warriors and free the universe of this dark evil? 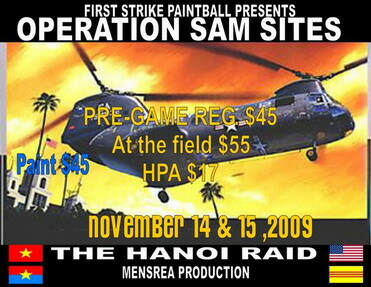 2 Day Scenario Game - "Operation Sam Sites- The Hanoi Raid" SCENARIO GAME at First Strike Paintball - November 14 & 15 , 2009 (Register Now !!!!!). This will be a Field paint only event ($45/$55 Case). First Strike Paintball and Mensrea Production will be teaming up to bring you the The Hanoi Riad Scenario Game which will be a Vietnam theme. The General for the US Army will be TBA. The General for the NVA will be TBA. Entry Fee will be $45.00 until November 11th,, 2009, after this date the Entry Fee will be $55.00. High Pressure Air for the event will be $17.00 provided by PEA. CO2 will also be available. Register Now !!!!! The year is 1965. U.S. Air Force and Navy Planes have been bombing selected targets in North Vietnam for almost six months. Most of the worthwhile targets had been destroy. 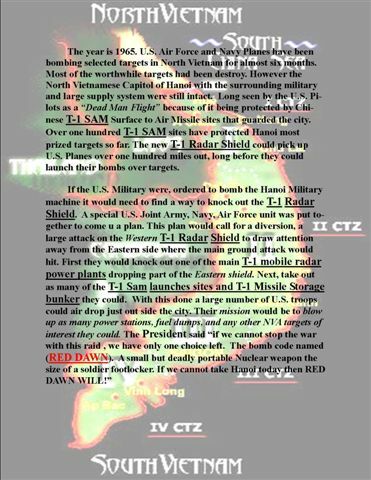 However the North Vietnamese Capitol of Hanoi with the surrounding military and large supply system were still intact. Long seen by the U.S. Pilots as a “Dead Man Flight” because of it being protected by Chinese T-1 SAM Surface to Air Missile sites that guarded the city. Over one hundred T-1 SAM sites have protected Hanoi most prized targets so far. The new T-1 Radar Shield could pick up U.S. Planes over one hundred miles out, long before they could launch their bombs over targets. 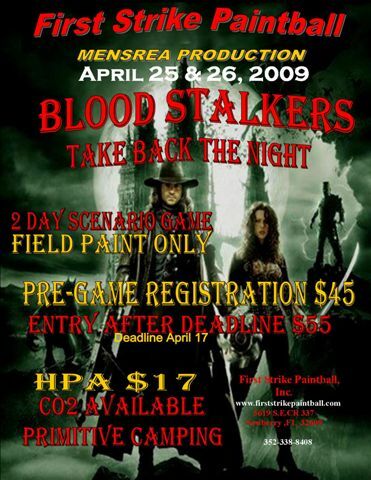 2 Day Scenario Game - " Blood Stalkers - Take Back the Night " SCENARIO GAME at First Strike Paintball - April 25 & 26 , 2009 (Register Now !!!!!). This will be a Field paint only event ($45/$55 Case). 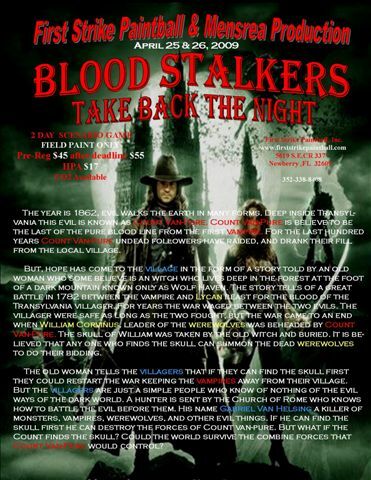 First Strike Paintball and Mensrea Production will be teaming up to bring you the Blood Stalkers Scenario Game which will be a Vampire theme. The General for the Vampires will be C. (Tippy) LaChapelle. The General for the Villagers will be Eric "Sasquatch"Juchniewicz. Entry Fee will be $45.00 until April 17th, 2009, after this date the Entry Fee will be $55.00. High Pressure Air for the event will be $17.00 provided by PEA. CO2 will also be available. Register Now !!!!! 24 Hour Scenario Game - "The Sacking of Wessex" SCENARIO GAME at First Strike Paintball - September 13 & 14 , 2008 (Register Now !!!!!). This will be a Field paint only event (Draxxus $45/$55 Case). 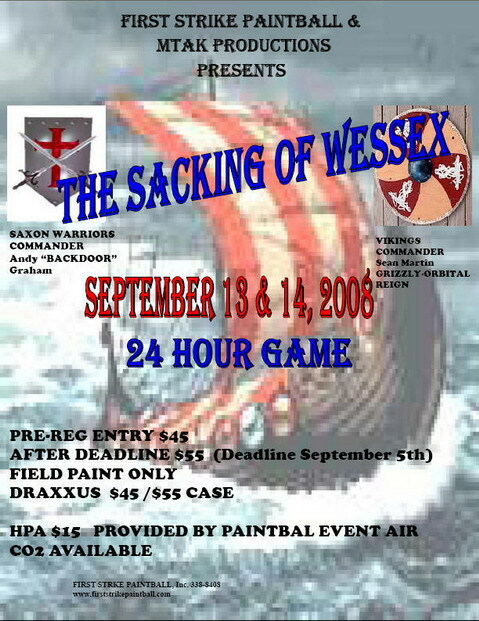 First Strike Paintball and MTak Productions will be teaming up to bring you the The Sacking of Wessex Scenario Game which will be a Viking theme. The commander for the Vikings will be Sean Martin (Grizzly). The commander for the Saxons will be Andy "Backdoor" Graham. 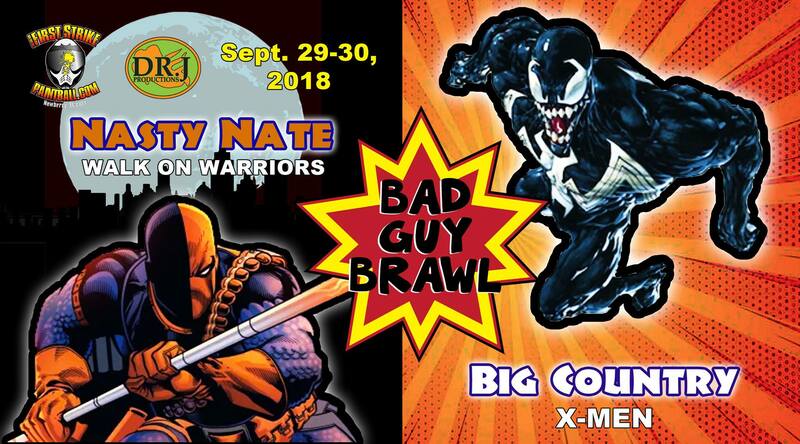 Entry Fee will be $45.00 until September 5 th, 2008, after this date the Entry Fee will be $55.00. High Pressure Air for the event will be $15.00 provided by PEA. CO2 will also be available. Register Now !!!!! The Viking longships were ghosting through a thick fog close to the shoreline along the Somerset Marshes. Guthrum could feel that this was as close to the Saxon Fort Athelney as he could get and still maintain the level of surprise he favored. On the cliff above the river stood the Monastery of Wiltshire and beyond it the settlement of Wiltshire in the Anglo Saxon county of Wessex. Guthrum intended to have a banquet that night drinking the fine mead made by the monks and eating the best food the area could provide. His entertainment would be watching his men slowly torture the inhabitants to death as a sacrifice to the Norse God Odinn in preparation for the major blood bath tomorrow as his men plunder Wiltshire. His was the first boats of a vast fleet of longships coming down the coast to take Wessex not merely to gather supplies but to overrun and colonize. Alfred, brother of the king of Wessex, was by chance celebrating his 23rd birthday at Athelney that same morn. Little did he know that this casual visit was to set the stage for him to become the fist Anglo Saxon to attain the state of King of England and to be the only English King to ever carry the title of “the Great.” Obviously he wasn’t aware of Guthrum’s plans and certainly didn’t foresee himself in a years long conflict to decide the fate of his country. The call to arms sounded far too late to save the poor monks at Monastery Wiltshire but shield, sword, long box and spear all will play a part in the conflict to save Wessex from total collapse under the onslaught of the Danes. 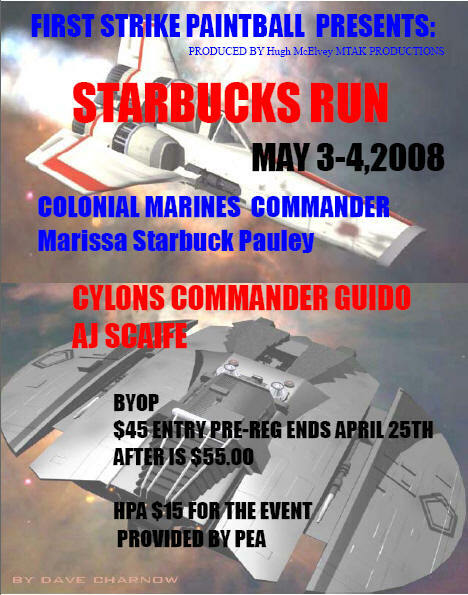 Starbuck's Run - Scenario Game - May 3-4, 2008 - COMPLETED!!!! We would like to recognize our ref staff (They gave all they had all day long - your guys are awesome) and especially Hugh McElvey (MTAK productions) for stepping up on short notice and making this an awesome game. The Warhounds who always give their very best. The field has never looked so good!! We would like to thank Team Gone Ballistic who volunteered to help ref this game, and always willing to do what it takes to make the game run smoothly, thanks for ALL you do. Thanks to Paintball Event Air for providing HPA and for making the extra effort to provide it for both sides of the field. Thanks to Acara and Major for volunteering to give first aid. To all those first time players and veterans, thanks for playing stand up paintball. I come to you with a tale of the rouge pirate princess called Starbuck by her friends. Starbuck and the Colonial Marines that have been working with her have run into a bad streak of luck as she races across the galaxy just ahead of the relentless bounty hunter Guido and his batch of feared Cylon warriors. Starbuck and her friends are just returning from a raid against a space yacht owned by a real nasty Prince-Admiral named Hasken. He is furious that his personal fortune, including the famous crown jewels, have been stolen. He wants them back at any cost and has posted a huge bounty on the young pirate for her head and the return of his fortune. Starbuck and her Colonial Marines have other uses for the riches though; they will go a long way toward helping the rebellion. Running low on fuel Starbuck and her friends landed her beloved star cruiser, ISIS, on Tatooine far out in the distant Ring World Sector. Unfortunately for Starbuck and her crew Guido has contacted one of his spies that identified the ship and has managed to sabotage ISIS. The massive bounty for the young pirate would put Guido in grand shape and he fully intends to make good on this capture. The young space-pirate means nothing to Guido except wealth and more power than even he can imagine. Come join the fun as Starbuck attempts to effect repairs for her starship and Guido tests is luck at capturing the very clever lady pirate. Bullets, bolts, bucks, bars, parts and points fly as the desperation increases. Without a doubt this is going to get interesting. Pauley's Rangers Tanzania - March 29th-30th, 2008 - COMPLETED!!!! The Pauley's Rangers Tanzania game was a huge success with over 500 participants. First Strike would like to thank Thunder and Deadman for their part in making this the largest game at First Strike. 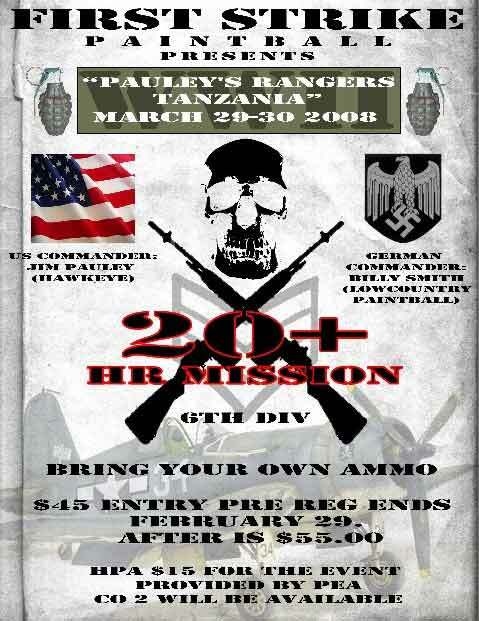 First Strike would like to thank all of the players that came out to play Pauley’s Rangers. We want to recognize all that played stand up paintball, you give paintball a good name, thanks for playing honorably. We would like to recognize our ref staff. They never stopped working and working tirelessly. The Warhounds who always give their very best. The field has never looked so good!! PEA who always gives us great air. Just ten days previously the British, under General Bernard Montgomery, had won a smashing victory at El Alamein. Now one of the greatest foot and tank races in history began: the effort by the British forces to intercept Rommel’s forces before they reached Tunis some nineteen hundred miles to the west. It was impossible for the Germans to escape by sea across the Mediterranean because the British Navy and Allied Air Forces were in complete command. The Germans had no ships in the Mediterranean, and those the Italians had were insufficient to do the job. The Allied force landing at Bougie tried to disembark some troops at the nearby port of Djidjelli but was thrown back because of the heavy surf. Consequently, Bougie’s airfield was not in operation. Meanwhile, lacking any air support, the landing force lost several ships to German air attacks. Spearheads were sent across the Tanzania border with orders to contact the French and reconnoiter to the east. Unfortunately for the Allies, the terrain in Tanzania is easily defended. The Atlas Mountains form an inverted V running southwest from the seaport of Tunis. There are few roads and railroads; and in the extreme north, the mountains are cut by streams, but the valleys are easily blocked off. Bad luck and bad weather dashed Allied hopes of seizing the remainder of Africa quickly and cheaply. The race for Tanzania was about to be decided by a clash of arms. Halo 3 - January 5th, 2008 - COMPLETED!!!! A Huge "Thank you" to all the players and teams that attended this event, there were around 120 players that squared off against each other and they all played hard! Thanks to Captain Obvious it was a tied score going into the last battle and the Master Chief and his marines prevailed! 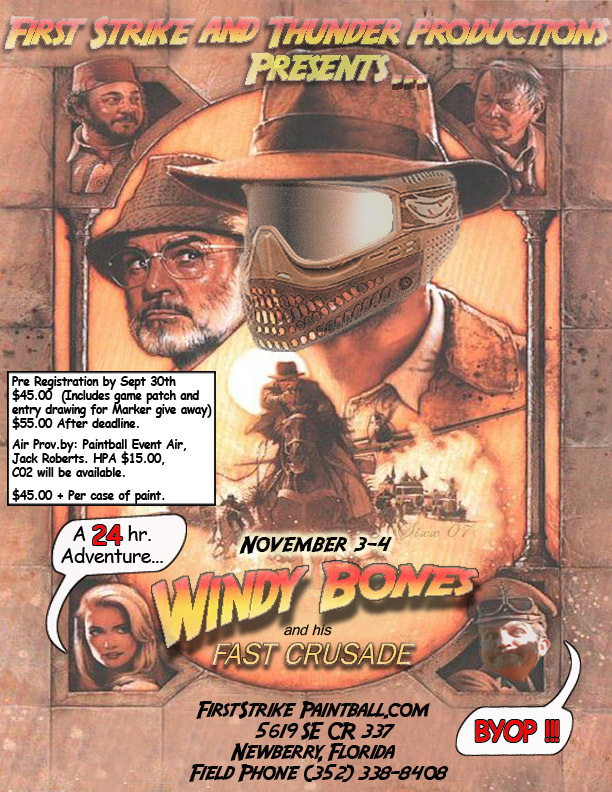 Windy Bones and the Fast Crusade - November 3rd & 4th, 2007 - COMPLETED!!!! The Windy Bones Scenario game was a huge success with close to 200 participants. The game started on Saturday at 11:30 a.m. and finished on Sunday at 2:00 p.m. The ultimate winner was team Windy Bones with a score of 268 hard earned points over team Germans with a close score of 266 points. It was completing the Trivial mission which determined the winner. Team Windy Bones worked all of the small missions and solved the "questions" and "puzzles" to earn the 2 point margin of VICTORY. First Strike Paintball would like to give a "SPECIAL THANKS" to the following: Thunder Productions, all teams, and players. Also, a GREAT BIG "THANK YOU" goes to the WAR HOUNDS who were responsible for getting the fields into the dynamic shape they were in. We also appreciate the work done by all the STAFF and Referees in making this a safe and enjoyable event. Last but not least we would like to give a "SHOUT OUT" to Team Gone Ballistic for providing a DEMON of a Tank. We know it takes a boat load of time, effort, and MONEY to prepare such a BEAST.